New JT Defense grips, specifically made for excellent grip, appearance and traction. Custom made to exact tolerances, and installs in minutes. Laser cut gun grips, specifically designed for each individual handgun, wrapped around specific areas of the gun's grip, seam sealed and molded right to each individual gun's frame. We have spent dozens of hours on each decal gun grip design, and have grips specifically designed for the look, feel and individual texture of each gun. Only tools required are alcohol, a lint free cloth, hair dryer or heat gun, and following our simple instructions included in each box. 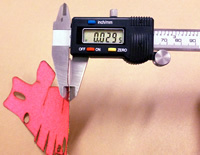 Our grip tape is very thin, only measuring .029" thick, adding very little overall thickness to each firearm. Textures are perfect, selected from a variety of tapes, and custom prints and patterns. If you can't find exactly what you need on our website, please email us and we can make custom tailored grip products for your specific firearm. We can even do print patterns, designs, or etching on your grips, We can cut, design or etch any pattern imaginable, even custom branding for your company or business. Contact us for more information.